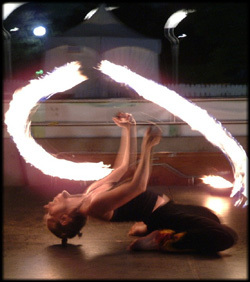 Whether your event is big or small, indoors or outdoors, Fire Weavers or Mini-cirque will add an exciting sensory experience that guests will remember for a long time. We can perform for almost any type of event including festivals, concerts, corporate events, nightclubs, special events, weddings, house parties, and more! Performances are insured with $2 million in liability coverage, and adhere to strict safety protocols. Performances require a stage or clear open space of 20 feet x 20 feet minimum. All props required are supplied by the performers. Set to a vibrant fusion of electronic world beat music, the fire or glow show is 10 to 20 minutes in length. All other animations can be adapted to suit your specific needs. Based in Ottawa, Canada, we perform locally and abroad. We travel light, and are more than willing to come perform for you! Book these dynamic performers to add some magic to your next event! We look forward to dazzling you! © 2003-2008 Fire Weavers. All rights reserved.